Today sees the launch by ArchiNed and 010 Publishers of architectureguide.nl and architectuurgids.nl. These websites give access to every item ever featured in the architectural guides issued in book form by 010 Publishers. The website will also be added to the ArchiNed menubar. The online version offers many new search and select options. For example, the more than 1500 items can be seen on a map of the Netherlands complete with streetview and the option of choosing between a map and a satellite image. 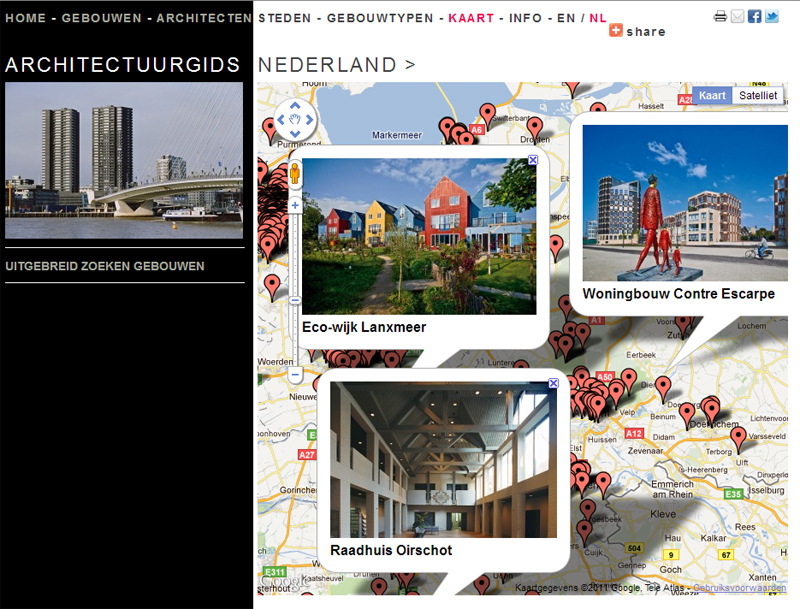 Architectureguide.nl is regularly expanded with a surprising range of items old and new. This keeps it up to date both as a source of inspiration and as a reference work for architecture in the Netherlands. Paul Groenendijk and Piet Vollaard's professional and unbiased editorial work is a guarantee of the quality of the items and of the information attendant on them. The two architectural commentators were responsible for compiling 010 Publishers' celebrated and critically acclaimed architectural guides. If architectuurgids.nl provides reliable information for Dutch visitors and professionals alike, architectureguide.nl makes this selection available to the English-speaking world at large. The websites have been made possible by a contribution from The Netherlands Architecture Fund.